Every spring Hannah liked to visit the stream where the chub spawned. It was a shallow and stony channel, running behind the backs of houses, with a short stretch visible from the road. She had once lived in a house backing onto the stream, and the annual spawning of the fish had been a well-kept local secret. In the spring sunshine, the females were clearly visible from her garden, suspended above the gravel stream-bed, unloading their eggs. Now Hannah had to take a bus across town to visit the spot. This year, as she turned into the normally quiet street, she was surprised to see a party of school children lined up along the railings. They were dressed as fish. A large information board had been erected, with pictures showing the life cycle of the chub. It appeared the place had been designated a ‘wildlife hot spot’. Some of the children were scooping dirt from the gutter and throwing it at the fish, while their teachers looked on. One little girl, Hannah noticed, was holding a crushed beer can which she seemed about to toss into the stream. 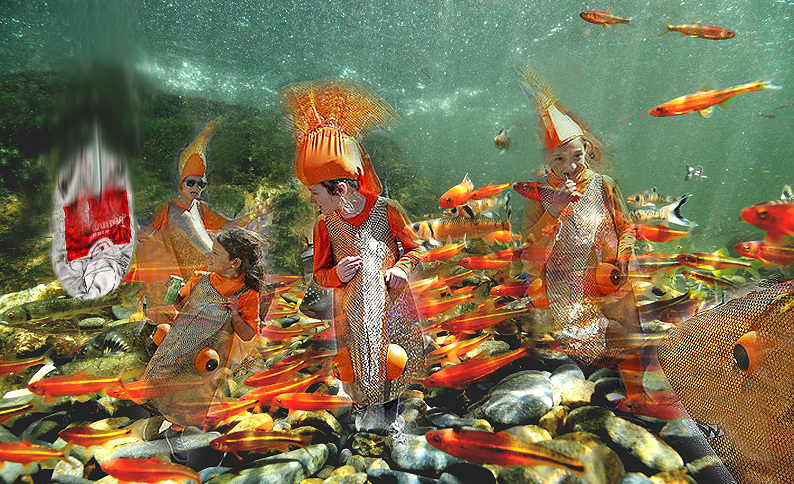 She was dressed as an angel-fish, in bright orange, ribbons trailing from her fins. This entry was posted on 16 March, 2019 in homepage and tagged Claire Palmer, Simon Collings. Bookmark the permalink.